Miguel Almiron became Newcastle's record signing last month. Newcastle United legend Alan Shearer believes the signing of Miguel Almiron is exactly 'what the club has needed'. Almiron, 24, became United's record signing last week after joining Rafa Benitez's side for a reported £20million fee. The Paraguay international could make his Newcastle debut at Wolves on Monday night and Shearer is looking forward to seeing him in action. “It has been a long time coming," Shearer told Sky Sports before he was inducted into Blackburn Rovers' Hall of Fame. “It is what the fans have wanted and what the club has needed. “He is at a brilliant football club and if he can do well there he will be absolutely loved. 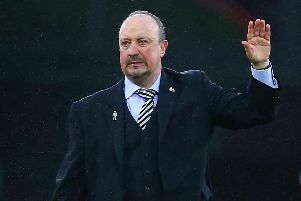 Newcastle will face a difficult test against Nuno Espirito Santo's side, who have won their last three league games to move up to seventh in the Premier League. The squad should also be refreshed from their warm-weather training camp in Marbella, which followed Tuesday's FA Cup win over Shrewsbury. But Espirito Santo isn't taking the game lightly, especially after Newcastle's recent performances against Manchester City and Tottenham. “It’s been very good. The weather is good and the way the boys are working," said the Wolves boss at the team's training base in Spain. "They are committed, they are focused. It’s what we came for – to work hard and, at the same time, have these social bonds that we want to create stronger.